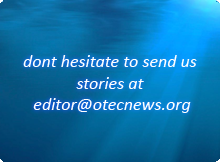 According to the Honolulu Star-Bulletin, Ocean Engineering & Energy Systems (OCEES) announced on Friday 2 June that they will build a 1 MW OTEC power plant [cached] at the National Energy Laboratory Hawaii (NELHA). They also announced that they will build a 13 MW plant for the U.S. military forces at an undisclosed location. This is most likely the plant which has been discussed for Diego Garcia for some time now.